Is This Jesus Christ's Real Tomb? A team of archeologists claims that it has found the real tomb of Jesus Christ. They are convinced that several pieces of evidence point to the veracity of their claim. The latest one is this 2,000-year-old engraving on the side of an ancient burial site. Simcha Jacobovici—a Canadian film director with three Emmys for Outstanding Investigative Journalism—and his archaeology team believes that this is a fish with a human figure inside, which according to them refers to the story of Jonah. According to the Old Testament, Jonah was a prophet, swallowed by a whale sent by God to rescue him after he was thrown out of a ship. Jonah then spent three days and three nights inside the whale's belly before being vomited out alive. Christians believe that this symbolizes the crucifixion, death, and resurrection of Jesus. The researchers also claim that the grave site has these other words engraved in the stone: "Jesus, son of Joseph." The archeologists believe that the tombs are located in a land that was owned by Joseph of Arimathea at the time. 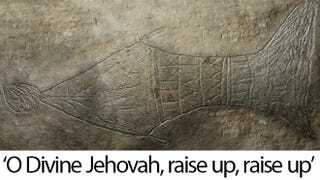 There is also another engraved inscription that can have multiple meanings: "O Divine Jehovah, raise up, raise up" or "The Divine Jehovah raises up to the Holy Place" or "The Divine Jehovah raises up from." James Tabor—a Biblical historian and the Chair of the Department of Religious Studies at the University of North Carolina at Charlotte—seems to believe them. Tabor says that these inscriptions are extremely rare. Only 2,000 ossuaries have been found in Israel so far. Of those, only 650 have inscriptions and only 12 have epitaphs. None of those are comparable to the ones found by Jacobovici, according to Tabor. However, there are many other who believe the claims are false. Mark Goodacre, a religious studies professor at Duke University, thinks that their heads are "full of DaVinci Code," referring to the 2003 mystery novel written by Dan Brown about the descendants of Jesus. University of Iowa assistant professor of classics and religious studies Robert Cargill thinks the story is bogus, saying that there are "clearly handles on the top of the so-called ‘Jonah fish' image, but Tabor and Jacobovici don't include them in their museum replicas or the CGI image: "No credible scholar except those that work with or for Simcha on this or some other project believe his conclusions… The evidence does not support their sensational claims. But that doesn't stop them from wanting it to be true, so in their minds, it's true." So, is this Jesus' real tomb yes or not? Jacobovici's findings will be shown today in a Discovery Channel special The Resurrection Tomb Mystery at 10 p.m. Eastern Time. The program will show images of the tomb's interior, taken with a special robotic arm (on the image above) that was introduced in the sealed burial chamber through holes drilled from the exterior.